Tag line: "When you've seen it all, you'll swear there's never been anything like it!" This is how Raymond Shaw (Laurence Harvey), the tragic figure at the center of John Frankenheimer's 1962 political thriller, The Manchurian Candidate, describes his relationship with his mother, Eleanor Iselin, played by Angela Lansbury. In the '80s, my mom watched Ms. Lansbury every Sunday night in Murder, She Wrote, the award-winning TV mystery series in which she was the kindly author, and novice sleuth, Jessica Fletcher. Having grown up with this squeaky-clean image of her, I couldn't imagine Lansbury as a villain. But after The Manchurian Candidate, I'm thinking Murder, She Wrote was the real stretch; she does evil too damn well for it to be an act! A Sergeant in the United States Army, Shaw (Harvey) returns from Korea a decorated war hero, receiving the Congressional Medal of Honor for bravery. The men who served under him hold Shaw in the highest regard, and every one, including his superior officer, Capt. Bennett Marco (Frank Sinatra), believes he is the best of men. Shaw’s mother (Lansbury) and her second husband, the ambitious Senator John Iselin (James Gregory), take advantage of their son’s popularity, using it to fuel Iselin’s re-election campaign. But recently, Capt. Marco, now a Major, has been haunted by a fuzzy memory, one suggesting Shaw is not the hero he appears to be. In truth, he, Shaw, and the entire platoon were kidnapped while in Korea, and brainwashed by Communist agents. The same hypnosis that convinced Marco and the others Shaw was a great guy also transformed Shaw into a deadly assassin, who doesn't realize he's been conditioned to act against his country. Now back in the U.S., Shaw is at the mercy of his American contact, and will carry out his covert mission without any memory of having done so. Will Marco learn the truth in time to stop Shaw, or is he already too late? The Manchurian Candidate is an intense motion picture, with memories that are always just out of reach, and a false reality greeting its characters at every turn. You can spot the tension in their eyes as the camera closes in on them, revealing the crippling anguish in control of their minds. 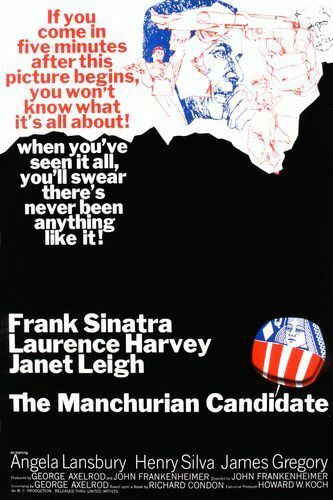 With incredible suspense that only grows stronger as the movie progresses, The Manchurian Candidate is, without a doubt, one of the greatest psychological thrillers ever put to film. The Manchurian Candidate will be in my top 50 movies that I'm doing over at my blog. An absolute stunner of a film. Robert: Thanks for the comment! And a movie definitely worthy of a Top 50 list! This is one of my all-time favorites, too. All of the cast are great. I read somewhere that Lansbury was actually younger than Harvey, who played her son. What a great villain she is in this film. I've never cared much for Harvey, but he was perfect for this role. The story is that the Kennedy family pushed to have the film taken out of circulation. Too close to home, I guess. Sinatra having close ties to Kennedy probably helped. i think the film taken out of circulation was another Sinatra movie called SUDDENLY about an presidential assassin (Frank). The similarities were way too eerily close to Lee Harvey Oswald. It was Sinatra who took it out of the loop.